UN peacekeepers in Haiti have stormed a slum in the capital, Port-au-Prince, killing armed gang members loyal to the country's ousted president. 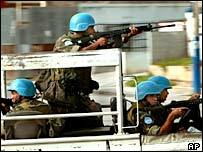 At least two men were killed during several hours of gunfights between the 350 peacekeepers and armed men. A powerful gang leader and supporter of former President Jean-Bertrand Aristide was reported to be among the dead. The raid of the Cite Soleil shanty town, on the edge of the island, was the second slum offensive in two weeks. Haitian police chief Leon Charles said he was quite sure that gang leader Emmanuel Wilmey, known as "Dread Wilmey", had been killed. "We are not able to give a death toll at this time but we are 80% sure he was killed in the operation," Mr Charles told Agence France Presse. Haitian authorities say Mr Wilmey is behind a surge in violence in the capital. A 7,000-strong contingent of UN peacekeepers has struggled to maintain order in Haiti since Mr Aristide's ouster. Last week, UN peacekeepers stormed the slum of Bel Air, shooting dead six suspected gang members and freeing a kidnapped Red Cross worker who was being held there. Haiti is scheduled to hold elections later this year, though correspondents say these might be delayed because of the unrest. Official statistics show that just 200,000 of the country's eligible 4.5 million voters - less than 5% - have registered to vote.